I am happy to report that the launch of ‘The Battle of Wood Green’, on Friday evening, went WONDERFULLY well. Fortunately, the books turned up (just in time) which was something of a relief. And also fortunately, a great many of them were sold on the night (more, in fact, than in the whole of the first week following release of ‘The Shelter’). Thanks must go to everyone who helped with the evening – including the young man on my right (in the picture) who, for those of you who don’t know him, is my number one son Tom. 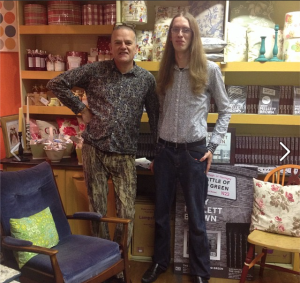 My sincere apologies for my crimes against fashion – whereas Tom went for the Status Quo look (but he has an unfair advantage), I resorted to a pair of paisley flares (never a good idea). I promise to return them to a place of safety without delay. After the launch on Friday, it was off to a friend’s house sale/party on Saturday evening for another bout of book signing (thank you KTM for a great evening). Met some lovely people, introduced lots of them to the adventures of Harry Stammers, sold yet more books and ended up eating MacDonalds with three lovely ladies at 1am (proof, if it was needed, that I do know how to treat a lady!). Then, finally, rounded off the weekend with a trip to the cinema today to see The Imitation Game (courtesy of Janice and Ian – thanks guys). If you haven’t seen it, you really should: – (https://www.facebook.com/imitationgameuk) – Good performances from Benedict Cumberbatch and Keira Knightly and a pretty accurate portrayal (I think) of the Alan Turing story – great stuff.